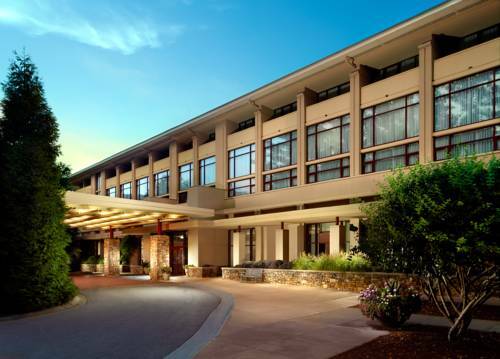 The Emory Conference Center Hotel features architecture inspired by the world renowned Frank Lloyd Wright. 325 beautifully appointed guest rooms it is located adjacent to 28 acres of pristine forest yet is only minutes from downtown Atlanta Buck head and Hartsfield International Airport. The beautifully appointed guestrooms are decorated in mission style furniture and feature a work desk dataports high speed internet access and many other amenities perfect for business travelers. Also featured is an elegant restaurant the Club Room Lounge an indoor pool health club a full service business center and jogging trails. This award winning hotel is Green Seal and Leed Silver Certified by the U.S Green Building Council. The Emory Conference Center Hotel is certified by the International Association of Conference Centers and prides it self with service excellence. Located on the Emory University Campus along the Clifton corridor our hotel is only 15 miles from Hartsfield International Airport 6 miles from downtown Atlanta and close to major shopping restaurants and area attractions. The Hotel is Green Seal and LEED Certified Silver by the U.S. Green Building Council. The historic Fox Theatre on venerable Peachtree Street has earned a reputation over the years as a wonderful venue for concerts movies plays and performances. The Georgia Dome the largest cable supported domed stadium in the world opened in 1992. Located in downtown Atlanta the Dome is the home venue for the Atlanta Falcons host to Super Bowl XXVIII and XXXIV.